Antigua and Barbuda  are two Caribbean islands, (Antigua, pronounced "an-tee'-gah" and Barbuda), that form a country that lies between the Caribbean Sea and the North Atlantic Ocean, east-southeast of Puerto Rico. 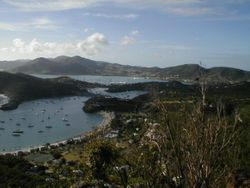 Antigua is perhaps the island which most typifies the modern day view of a small Caribbean destination. With few other natural resources, tourism dominates the local economy of both islands. Stunning white sand beaches abound, and on Antigua there is no shortage of attendant high-end resorts. Barbuda still has the beaches but little tourism-based infrastructure. Investment banking and financial services also make up an important part of the economy with many major foreign banks taking advantage of the nation's liberal banking laws. That may all change though after the 2009 arrest of Antigua-based Texan billionaire Allen Stanford who is accused of perpetrating an enormous fraud which may have bilked investors of some US$8 billion. Cricket is a huge sport here and this tiny nation has produced several genuine all-time world greats of the game. Cricket fans will certainly not be short of locals to chat with. The Siboney were the first to inhabit the islands of Antigua and Barbuda in 2400 B.C., but Arawak and Carib Indians populated the islands when Columbus landed on his second voyage in 1493. Early settlements by the Spanish and French were succeeded by the English who formed a colony in 1667. Slavery, established to run the sugar plantations on Antigua, was abolished in 1834. The islands became an independent state within the British Commonwealth of Nations in 1981. The climate is tropical marine with little seasonal temperature variation. The islands experience hurricanes and tropical storms (July to October), and periodic droughts. Officially 230V 60Hz. Most outlets are the standard British type. Generally speaking, U.S. and Canadian travellers should pack adapters for these outlets if they plan to use North American electrical equipment in Antigua & Barbuda. Contact your hotel and ask to be sure. Many places are now built to North American standards. Also in use are non-grounded North American outlets. These require an adapter to work with plugs that have the third grounding plug. Older North American outlets may not be polarized (with one slot wider than the other). To remedy this, the wider vertical blade on a polarized plug may be filed down to match the width of the other. Otherwise, adapters are available which accept a polarized plug and adapt it for use with a non-polarized outlet. All EU citizens can enter without a visa. Citizens of the following countries may also enter without a visa: Albania, Argentina, Armenia, Australia, Azerbaijan, Bahamas, Barbados, Belarus, Belize, Botswana, Brazil, Brunei, Canada, Chile, China, Cuba, Dominica, Fiji, Georgia, Grenada, Guyana, Hong Kong, Jamaica, Japan, Kazakhstan, Kenya, Kiribati, Kyrgyzstan, Lesotho, Liechtenstein, Macau, Malaysia, Malawi, Maldives, Mauritius, Mexico, Moldova, Monaco, Namibia, New Zealand, Nauru, Norway, Papua New Guinea, Peru, Russia, Saint Kitts and Nevis, Saint Lucia, Saint Vincent and the Grenadines, Samoa, Seychelles, Singapore, Solomon Islands, South Africa, South Korea, Suriname, Swaziland, Switzerland, Tajikistan, Tanzania, Tonga, Trinidad and Tobago, Tuvalu, Turkey, Turkmenistan, Uganda, Ukraine, United States, Uzbekistan, Vanuatu, Venezuela, Zimbabwe, and citizens of British Overseas Territories. If you do need a visa, you must have a passport valid at least 6 months after time of visit, a completed application form, and 1 passport size photo. A single entry visa costs 30GBP and multiple entry costs 40GBP. Note that if you are of a nationality that normally requires a visa and you are entering Antigua and Barbuda as a port for a cruise ship, you do not need a visa provided the ship will be leaving the day it arrives. V.C. Bird International, (IATA: ANU) (ICAO: TAPA) located in north eastern Antigua on the outskirts of St John's, is the country's main international airport. The airport serves flights into the United States, Canada, Europe and other Caribbean islands. LIAT (Leeward Islands Air Transport Services),  headquartered in Antigua, operates flights to various destinations in the Eastern Caribbean. Many excursionist come in via cruise ships and enjoy their day in Antigua. Many cruise lines travel to Antigua. Tourists mainly get around by taxi or tour operators. However for the tourist on an economy budget the bus service is acceptable, but slow. Unfortunately the nicest spots are only reached by your own transport. But if you stay a week or more, rates for rental cars become quite reasonable(see below). 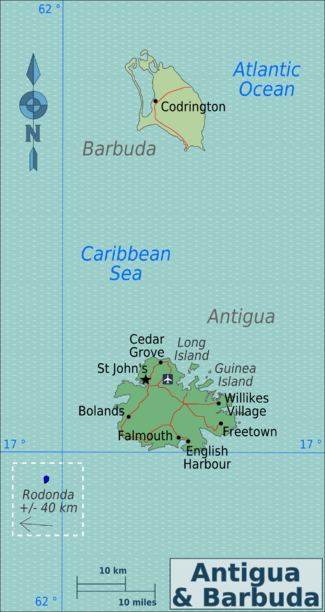 To/From Barbuda: The Barbuda Express offers ferries from Antigua. Car Rental The cheapest car rental you can find is Tropical Car Rentals Antigua: Tropical Rentals Tel: +1 268 562-5180, Fax: +1 268 562-5181, [email protected] Their cars are in top condition and their prices are way lower than others on the island. They pick you up at the airport and wait for you at your departure, thus avoiding any unnecessary additional taxi rides or such. Languages spoken are English (official) and local dialects. There is also an expanding Spanish-speaking migrant population. Sherley Heights - Historic National Park. Nelsons Dock Yard. Watch the sailing regattas. There are several events; the Antigua Classic Yacht Regatta and the superyacht Oyster Regatta both take place in April. Barbuda: Caribbean Fallow Deer, Caribbean Wild Boar, Guinea Fowl. Galley Boutique, English Harbour has great clothes. 1000 Flowers, St. John's has great clothes. Learn about local heritage and culture. Learn a bit of dialect along the way. Buy a copy of the local newspaper "The Observer": they have a nice cartoon in local creole which helps with the interesting Antiguan Dialect. Working longer than three months requires an official working license, to be filed with the employer. The employer also has to pay for it. There might be good jobs at the tourism sector and the entertainment industry (esp. on-line casinos and sports betting). The national dish is fungie (pronounced foon-gee) and pepper pot. Fungie is a dish very similar to the Italian Polenta being made mainly of cornmeal. Other local dishes include ducana, seasoned rice, saltfish and lobster (from Barbuda). Local confectionaries include sugarcake, fudge, raspberry and tamarind stew, and peanut brittle. The various restaurants around the island sell both local and international food. Lunch might be anything that can be easily bought from a nearby shop, especially a bakery. Dinner will typically be rice,macaroni or pasta, vegetables/salad, a main course (fish, chicken, pork, beef etc.) and a side dish like macaroni pie, scalloped potatoes or plantains. Local drinks are mauby, seamoss, tamarind juice, mango juice and coconut water. Adults favour beers and rums, many of which are made locally. On Saturday be prepared to find many drive-by barbecues at important road crossings all over the island. They are serving rice and chicken, dumplings, soup, and alike. Sometimes they even have a sound system for entertainment. Sunday is the day when the culture is most reflected in the food. For breakfast one might have saltfish, eggplant, eggs, bacon, sausages, or lettuce. Dinner may include pork, baked chicken, stewed lamb, or turkey, alongside rice (prepared in a variety of ways), salads, and a local drink. Harmony Hall, near Freetown. It closes for the summer on May 6th. The best restaurant on the island. Mama Lolly, Redcliffe Quay, St. John's. Vegetarian and vegan friendly home cooking. Calabash, Redcliffe Quay's "Vendors Mall", St. John's. Vegan cuisine. Owned by a raw chef who used to work in New York. The Roti King, corner of St Mary's Street and Corn Alley, St John's. Serves Roti, which is a East Indian dish of rolled Indian flat bread filled with hot and spicy curries and tamarind sauce. The only american style fast food chains operating on Antigua are KFC with three locations and Subway sandwiches in St. John's. Papa Zouk, Bar and fish and chips restaurant 2 mins outside of St. John's. Cavalier Rum , Antiguan Rum. There are many hotels in Antigua so finding one should not cause too much of a hassle. Dickenson Bay Cottages, St. Johns, Tel +1 268 462 4940, Fax +1 268 462 4941, [email protected], http://www.dickensonbaycottages.com, Lovely place with fully equipped loft apartments, pool, 200m from the beach. Jumby Bay, St. John's, Tel +1 268 462-6000,  With 40 suites and 11 villas, this resort offers many services and activities for its guests such as sunfloats, snorkeling, and sail boating. It also offers vacation packages. Though Antigua and Barbuda is a very safe place, secure your purses and wallets. Walk only with the necessary money, avoid street urchins and vagrants and don't be afraid to ask for help. If you rent a car, park in a well-lit area. While in St. John's, be mindful of casino scams. The Keno Palace Casino on St. James street runs a variation on the "Razzle Dazzle" game in which a woman will try to lure you in to the Casino with the promise of free bets. The game they bring you to involves pulling balls out of a hopper, with the ultimate goal being to tally a score over 100. You'll appear to be doing quite well at first, and will be enticed to bet real money to chase the cash pot. Before you know it, you may be out hundreds of dollars chasing a prize that you'll never win. Avoid this scam at all costs. Avoid taking unusual risks, eat more from packaged goods. However the public market is a great place to mingle and get inexpensive provisions. The locals are very friendly and respectable. Approach them in a courteous manner and it will undoubtedly be returned to you. Approach them with a smile and remember please, thank you, good afternoon. This page was last edited on 27 October 2018, at 12:57.